The broadcasting of spatial data together with an index structure is an effective way of disseminating data in a wireless mobile environment. Mobile clients requesting data tune into a continuous broadcast only when spatial data of interest and relevance is available on the channel and thus minimize their power consumption. A mobile client experiences latency (time elapsed from requesting to receiving data) and tuning time (the amount of time spent listening to the channel). 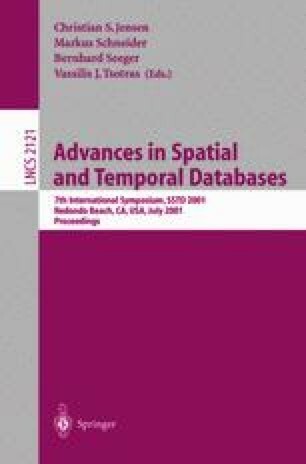 This paper studies the execution of spatial queries on broadcasted tree-based spatial index structures. The focus is on queries that require a partial traversal of the spatial index, not only a single-path root-to-leaf search. We present techniques for processing spatial queries while mobile clients are listening to a broadcast of the tree. Our algorithms can handle clients with limited memory, trees broadcast with a certain degree of replication of index nodes, and algorithms executed at the clients may employ different data structures. Experimental work on R*-trees shows that these techniques lead to different tuning times and different latencies. Our solutions also lead to efficient methods for starting the execution of a query in the middle of a broadcast cycle. Spatial query processing in a multiple channel environment is also addressed. Work Supported by NSF CAREER Grant IIS-9985019, NSF Grant 9988339-CCR, a Gift from Microsoft Corp., and the Purdue Research Foundation.